Justice Department Threatens To Sue Harvard In Admissions Probe : The Two-Way The investigation is looking into claims that its admissions policies discriminate against white and Asian-American applicants by holding them to higher standards than black and Latino applicants. A tour group in 2012 walks through the campus of Harvard University in Cambridge, Mass. The Department of Justice has opened a probe into the role of race in Harvard University's admissions policies and is threatening to sue unless Harvard turns over documents by a Dec. 1 deadline, according to correspondence obtained by NPR. The investigation is looking into allegations that the elite university's admissions policies discriminate against white and Asian-Americans seeking admission by holding them to higher standards than black and Latino applicants. These are claims also made in a 2014 federal court case filed by the anti-affirmative action group Students for Fair Admissions, which remains pending. 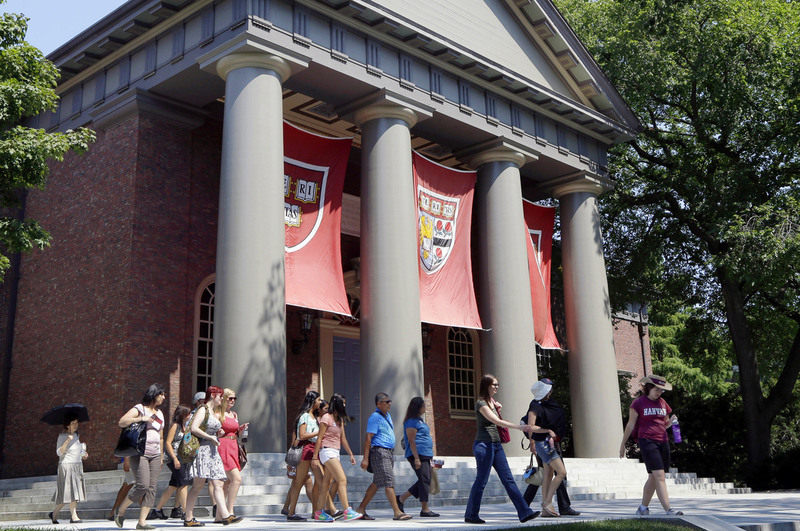 "Harvard has publicly stated that its admissions policies and ongoing efforts to enroll a racially and economically diverse student body are in compliance with the 1964 Civil Rights Act," reports NPR's Claudio Sanchez. "Title VI of that law prohibits federally funded institutions from discriminating on the basis of race, color or national origin." A Nov. 17 letter from the Department of Justice Civil Rights Division says that the U.S. has determined that Harvard is "not complying with its Title VI access requirements." Another letter from the same division says that in the two months since the initial request for information, "Harvard has pursued a strategy of delay and has not yet produced even a single document." The Justice Department is seeking "broad-ranging access to documents regarding Harvard's admissions policy and practices." It criticizes Harvard's questioning of why the Civil Rights Division is involved in the matter, saying it was delegated by the Department. Earlier correspondence from Harvard's lawyer to the Justice Department obtained by NPR suggests the university's skepticism about the probe. "[T]he opening of an investigation in the current circumstances is, to our understanding, so outside ordinary practices that Harvard is obliged to clarify the authority and rationale for the Department's decision," Harvard lawyer Seth Waxman's letter reads. He states that the complaint at the core of this investigation is two and a half years old, and is "even more unusual because, as you know, identical issues are being litigated in federal court." As Kirk Carapezza reported for NPR, when the complaint was made initially "the Obama administration dismissed the claim without evaluating its merit" due to the pending lawsuit.
" 'It seems entirely consistent with President Trump's campaign rhetoric,' says Tomiko Brown-Nagin, a constitutional law professor at Harvard. Brown-Nagin points out that the Trump administration's decision to target affirmative action policies comes as racial tensions are rising on many campuses.
" 'On the one hand, you have racial minorities, immigrants who are concerned about certain dynamics on campus,' she says. 'On the other hand, you have conservatives who feel like their voices are being shut down in debates over things like affirmative action and immigration and sexual assault.'" Waxman stated in a Nov. 7 letter that Harvard was willing to provide the Justice Department with documents produced for the federal court case, "with redactions for relevance, privacy, and privilege/work product protection." In the Nov. 17 letter, the Justice Department rejected the access plan as "impractical and unnecessary," saying it improperly limited its right to review the information. It stressed that it is not subject to redaction requirements and would not allow "entities under investigation to dictate what information qualifies as relevant to the investigation." In a statement to NPR, Department of Justice spokesman Devin O'Malley said it "takes seriously any potential violation of an individual's civil and constitutional rights, but we will not comment at this time." Harvard said in a statement that it will comply with its Title VI obligations. "In the process, we have an obligation to protect the confidentiality of student and applicant files and other highly sensitive records, and we have been seeking to engage the Department of Justice in the best means of doing so." "One possibility is that it could lead to litigation in court between the Justice Department and Harvard. In that case, if a federal judge finds that Harvard has violated Title VI, the court has broad authority to issue a remedy, such as ordering the university to change its admissions policies, experts say."